Many archaeological findings today on display in the museum of the water castle show that the area around today’s Egeln was already populated 40.000 years ago. But it was not until the year 941 that a settlement with a castle, which protected the junction of three highroads at a ford of the river Bode, was documented. Because of its favourable position and the protection by the castle the settlement developed and was later established as a proper town north-east of the river Bode, equipped with a church and a marketplace and protected by a new castle. In the year 1250 Egeln was conquered by the Nobles of Hadmersleben. The best-known representative of this family was Otto of Hadmersleben. According to the chronicler Leuckfeld, Otto was always ready to feud with someone and was also responsible for the struggle for Egeln in the year 1251, when the city was besieged by the steward John of lvensleben by order of the Bishop of Halberstadt. In the document describing this event the town Egeln (“civitas Egelen” – ‘Egeln’ is the German expression for ‘leech’) is mentioned for the first time. Otto of Hadmersleben, who now called himself the Lord of Egeln, presumably granted town privileges and the right to hold markets to the place after the events of 1251 (the town was partly destroyed in the siege). He had the town surrounded by a strong wall with two double town gates and also strengthened the defenses of the castle. In the year 1259 Jutta and Otto of Hadmersleben founded the convent Marienstuhl in Egeln. For 166 years the Lords of Hadmersleben ruled in the dominion of Egeln, until their lineage ended in 1416 with Count Kurt of Egeln. 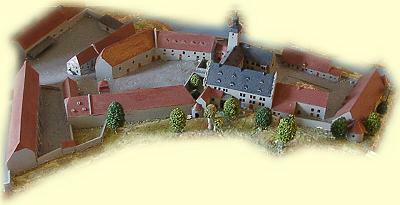 Via the Counts of Barby Egeln came into the hands of the cathedral chapter of Magdeburg and was used as a summer residence and appanage. Starting in 1430, the castle was extensively renovated and expanded. In the lower castle big barns were built to store the harvest and the upper castle was converted into a stately home. The town of Egeln, as well as the villages and lands surrounding the castle, were now administered by a bailiff from the cathedral chapter, who also exercised the higher jurisdiction. These bailiffs were primarily canons or nobles dependent on the cathedral chapter. When the Reformation was introduced in Magdeburg, members of the chapter – along with the cathedral treasury – took refuge at the castle in Egeln, whereupon they were besieged by troops from Magdeburg. After the castle was conquered, the Reformation was also introduced in Egeln. In 1612, a dreadful witch hunt took place in Egeln. The enlightened bailiff Schütze, who had to lead the trials, tried to persuade the cathedral chapter and the local clergy to stop these absurd accusations; he also contacted the University Helmstedt several times. Until his efforts became successful, over 30 women from Egeln were burned, drowned in the river Bode or decollated. In the Thirty Years' War the castle was repeatedly besieged and conquered by Swedish and Imperial troops. In 1631 the Swedish King Gustav Adolf granted the towns of Hadmersleben and Egeln to the Field Marshal Johann Banér for his services in the battle for Breitenfels. In 1632 he moved into the castle with his family. When at Easter 1635 the Lord High Chancellor of Sweden Axel Oxenstierna and other high nobles stayed at the castle to attend the christening of Johann Banér’s daughter, enemies of Sweden planned a murder attempt, which could be prevented by the Lieutenant Colonel Erasmus von Platow. After the Peace of Westphalia Egeln came into possession of the later Prussian king, who then began to let the town and castle to deserving officers, appointing them royal bailiffs. Here, above all, the family Wilhelm und Friederike Wahnschaffe, who were administering Egeln during the difficult times of the Napoleonic wars, have to be mentioned. They not only had to take care of the changing occupying forces (at times they had to provide quarters and food for up to 200 soldiers), but also had to entertain visiting celebrities such as Queen Louise of Prussia, Count Bernadotte, Count Murat and General Blücher. With the introduction of sugar beet cultivation the bailiff Honig triggered an economic upturn in Egeln at the end of the 19th Century. The bailiff Steinkopf ordered to create the “Steinkopfsgraben” moat in order to regulate the river Bode and to dewater the swamp. After 1945, the facility became a state-owned estate. However, there was a lack of interest in preserving the historic buildings, so a period of increasing decay began. In 1987 the Egelner watchmaker Hans Grube convinced the estate manager to support the “Water castle action plan”, thus preventing a decision of the town council to fill the already silted-up castle moat with construction rubble. He also convinced authorities to start restoring the keep (“Bergfried”) and the gatehouse in 1991. Since 1993 these buildings accommodate the museum of prehistory and protohistory, as well as the museum of town and castle history. In October 1995 the castle became the property of the city of Egeln; the long-term objective is to develop the castle into a regional cultural center. Throughout the year the castle provides the stage for numerous events organized by the museum, the local history preservation society or the castle support association. In the lower castle the old forge is being restored. The upper castle now contains an open-air stage, a painting school and a theatre which can also be used for festivities. The gatehouse of the castle can now become the setting for a romantic marriage ceremony. Since 2007 the castle also offers rooms for overnight stays.